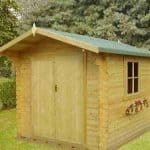 Being highly experienced navigating the garden building industry, we here at WhatShed know how tricky it can be to find just the right log cabin. There is a vast array of suppliers offering a variety of different makes and models. Luckily for the shed-buying public, WhatSheds is here to help. We make it our goal to personally visit manufacturers to see their garden buildings in action before relaying all the important information to you. One such visit formed part of the research for this review of the TigerSheds Delta range. We were lucky enough to inspect the quality of several 44mm garden building (such as the Shere) at the Horsforth, Leeds TigerSheds show site recently. First impressions of The Delate are strong. With its reverse apex-style construction, the cabin is modern looking and spacious. 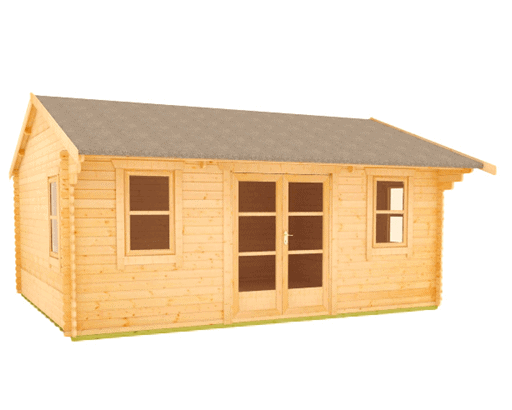 From a brief look around the display models in Leeds, it is obvious that TigerSheds is committed to providing high quality garden buildings to its customers. Timber is tastefully finished, and the entire construction feels solid as a rock. The Delta certainly isn’t the cheapest garden building on the market today. However, its superior build-quality versus many of its peers easily justifies its premium price point. TigerSheds owns its own saw mill. Base level log cabin is fit for purpose even if you pay for none of the optional extras. The Delta model comes in numerous different sizes and customers can choose between a total of five widths (at 2’ intervals between 10’ and 18’). A full list of these dimensions can be found below. However, if none of the listed sizes suit your needs. The length, width, and thickness can all be customised at a cost. In addition, TigerSheds will also reduce the height of any of The Delta range for free to ensure it’s compliant with relevant planning regulations in your area. The Delta range of log cabins by TigerSheds is constructed using European red wood. This slow growing variety of timber might be a little pricier than the materials offered by other garden building manufacturers but, as is often the case, you get what you pay for. Since the wood used in the construction of The Delta range is of a slow growing variety, sheds and log cabins built using it benefit from far greater longevity since it is less inclined to warp or split, and the finish comes out smoother with far fewer knots. This is quite evident when you look at the photographs we took of the buildings during our site visit, you can see examples here. Compare this with the Baltic white woods used by some of TigerSheds’s competitors. This faster growing building material might save you a few quid in the short-term but is certain to succumb to the elements much quicker than offerings using superior materials, such as The Delta range. One of the things WhatShed love most about TigerSheds’s service is the fact that the company operates its own mill in Yorkshire. With each cabin being made to order, it is much easier to feel confident in the end constructions since bad cuts can quickly be replaced and a much greater degree of inhouse quality control can be executed. By contrast, many of TigerSheds’s competitors do not have the facilities to mill their own timber. When such manufacturers are forced to use imported materials in garden building construction, as many do to save on costs, products can be sat waiting in a warehouse or at some point during the shipping process. This substantially increases the likelihood of warping in transit and could result in the delivery of an inferior garden building. The Delta range is supplied untreated. TigerSheds recommends that the materials used in its construction be treated using a spirit-based treatment within 14 days of construction. Proper cabin-care is made as easy as can be since TigerSheds itself supplies two different spirit-based treatments for their products – Cuprinol in a selection of six different colours and TigerCare, which offers a more natural finish, in a choice of three colours. 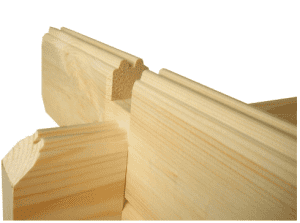 The walls of The Delta range are all 44mm thick and chamfered (planed) as standard. This gives a luxuriously smooth finish to TigerSheds’s products and The Delta is no exception. Although there are customisation options, we believe the thicker-than-average, 44mm by default walls to be one of the many strengths of The Delta. TigerSheds has produced this model to be a quality garden building right from the get-go, and the firm has not cut corners to reduce building costs. This means The Delta offers exceptional longevity when installed and treated correctly. Previously, we have seen garden buildings supplied by many other manufacturers use just 28mm thick walls in construction. Evidently, such log cabins will struggle to compete with those offered in The Delta range in terms of durability, warmth, or security. The walls themselves are assembled using a four-way notch assembly system as illustrated in the picture. This ensures a very snug build with less risk of penetration by the elements. Additionally, TigerSheds have used double tongue and grove joints to make the cladding on The Delta sturdy, resistant to weathering, and attractive. The often-loose-fitting, square-cut equivalents used by some competitors simply can’t offer the same level of quality or year-round comfort. The Delta’s roof is an apex (double sloping roof that meets in the middle). This gives the cabin a classic feel, despite its modern construction methods and finish. The shed also features a 695mm overhang around the roof, giving it a little more character than some competitors’ equivalent cabins. The roof itself is built using 19mm tongue and groove roofing boards and features recessed pearlings. The benefit of this is an entirely gapless roof, capable of offering superior protection from the elements year-round. The dimensions for this frame are 44mm by 122mm. Evidently, TigerSheds stuck to their trend of using superior materials of more-than-adequate dimensions here too. The resulting cabin is structurally sound throughout and its roof is no exception. The roof is finished with standard mineral felt as the default option. 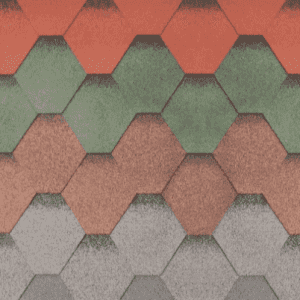 However, upgrading to “heavy duty green mineral felt” or shingles is available at an extra cost. This latter option can give the building a more desirable aesthetic given that the shingles come in a choice of four colours (red, black, green, and brown). We were particularly impressed to see the same shingles as The Delta used at the Youth Hostel in Pen-Y-Pass in North Wales – a location that is absolutely no stranger to brutal weather conditions. However, all the choices, including the standard mineral felt, are more than adequate in terms of protection from the elements. Guttering can also be added to The Delta range of cabins as an upgrade. All pieces of guttering supplied by TigerSheds come predrilled. This makes installation of the additional feature incredibly straightforward, requiring just a few screws to attach to the roof. Although it may not be immediately clear from the website, The Delta range includes bearers and a floor in the price listed. The floor sits on a 58mmx44mm tantalised and pressure-treated frame and is built using 19mm pieces joined using a tongue and groove construction. After inspecting this personally, I am beyond impressed with how solid the floors of the 44mm Log Cabin range are — they just don’t budge at all! Although the 19mm floor was easily thick enough for most levels of abuse most log cabin owners will throw at it, those wishing to use their Delta garden building as a serious workshop, or for another potentially intense purpose, should consider upgrading the floor. Decking on either the front or side of The Delta can also be added as an upgrade. This decking comes in either 28mm or 44mm. We find that many manufacturers will offer an entry level shed with an inferior floor thickness. This can result in springiness underfoot. These suppliers will often provide an upgraded floor at an additional cost. We loved that TigerSheds’s don’t do this and all Delta models come with a more than adequate floor as default. Note: All garden buildings require construction on top of a very solid base. These bases are unfortunately not supplied by TigerSheds. Bases are needed to stop moisture seeping into the construction from beneath and decreasing the overall lifespan of the shed or cabin. The standard glass that comes with the default Delta models is draft-sealed, single-glazed and 3mm thick for both the windows and doors. Each size of cabin comes with a total of four opening windows resulting in a light and airy space inside. The Delta range also features frankly massive double doors making access to the building easy, even when moving large furniture inside. Doors and windows are professionally constructed by joiners and feature a rebated frame, resulting in an incredibly snug fit. They also feature internal beading and draft-sealing both inside and out. These design-choices combined result in a product that is highly resistant to the elements, even without any upgrades. 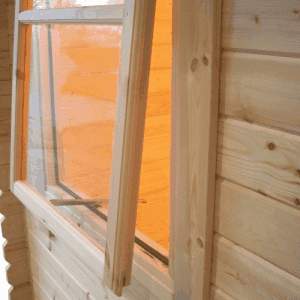 Whilst we find the 3mm single-glazing to be a great entry point – offering ample security and warmth during the warmer months – if you plan on using your Delta log cabin in the winter, perhaps one of the glass upgrades available would be more suitable. At an additional cost, users can benefit from toughened glass (4mm thick) or super-insulative double glazing (two layers of 4mm glass with a 6mm airgap). This latter option is twice as a thick as TigerSheds’s toughened glass, providing customers with an exceptional level of heat-retention and security. Whilst on the subject of security, the doors are equipped with a mortice lock, which provides a similar level of protection to the front door of a house. The often-flimsy cylinder locks favoured by some competitors simply cannot compete with The Delta at keeping undesirables away from your valuables! Along with many other features of The Delta range of cabins, the location of the doors can also be customised, as can the style of the fittings themselves. This allows customers an incredible range of options to tweak the style of the building to match their tastes – something not offered by every garden building manufacturer. The different styles of windows and doors offered are Georgian, European, full pane, fully boarded, or PVC. Each style comes in numerous different window and door designs. The Georgian features three doors and four windows, the European offers four windows and two doors, the contemporary full pane fittings come in three door styles and two windows, and the workshop-style full boarded doors are offered in a choice of three doors. It’s also worth noting that the PVC option comes with double-glazing as standard in just one style of door and window. Unfortunately, the sales module at the TigerSheds website isn’t great when it comes to customisation options. It can be a little tricky to find the right option to select exactly the preferences you want. If you can’t find one of the customisations listed in this review, just contact TigerSheds and they will advise how to include different features when ordering online. TigerSheds will deliver your Delta cabin using an 18-ton truck and crane. Being delivered personally by the manufacturer on a vehicle owned by the company is a nice touch since many competitors will use a third-party delivery service or unload units by hand. This can result in damage caused to construction materials. The use of a crane minimises that risk and if something were to go wrong in delivery, customers will only need to deal with TigerSheds, with no blame being shifted to third-party delivery services. This instantly inspires confidence in the company’s ability to deliver the highest quality, particularly given the many horror stories we’ve heard of competitors damaging building materials when delivering by hand. TigerSheds also make sure the time of the delivery suits you. Again another nice touch that we would like to see more manufactures adopting. The company provides a two-hour delivery slot, specified by the customer themselves – again, a nice touch not offered by every garden building manufacturer. In terms of installation, TigerSheds will offer this service. Whilst it is rather pricey, if you’re less handy, have limited time, or have mobility issues, having one of TigerSheds’s professionals assemble your cabin might be preferable. What’s more, if the manufacturer installs the unit, the liability shifts back to them if something were to go wrong during the cabin’s erection. 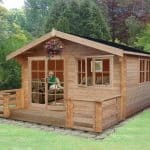 The Delta range of log cabins by TigerSheds is a quality collection of garden buildings and is priced well given the superior craftsmanship throughout its construction. The cabins use much higher quality materials than many competitors throughout their construction. All timber is cut to measure in the firm’s own mill and assembled using robust construction methods. This results in a building that will provide exceptional insulation, security, and longevity. Even the factory standard edition of The Delta (in any of the aforementioned sizes) is fit for purpose and none of the materials or build options strictly need upgrading. 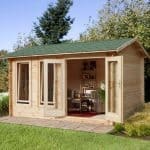 Of course, aesthetic considerations or eventual usage of your shed might make one of the various extras a desirable inclusion, but such a change should be an optional addition, rather than a necessity. 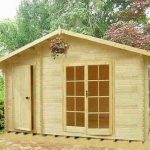 We’ve often seen shed manufacturers advertise a fantastic price to lure customers in. However, when it comes down to it, extras need adding and materials upgrading – all at a cost. Thankfully, this is not the case with The Delta by TigerSheds.